1. It's over 45 miles long and it involves over 10,000m of ascent. Just writing that has made my stomach leap into my throat. I attempted this event last July and it ended with me having to physically lift each leg onto the next step with my hands. And that's not even the worst part. 2. I'm afraid of heights. Last year found me clinging to scree slopes over dizzying drops and hyperventilating while my brother tried in vain to talk me out of my panic attack. Every step I took resulted in more wailing from me as the view would change slightly, opening up to yet more terrifying vistas. Each time I flung out a flailing arm to steady myself, rocks would be dislodged and would hurtle down the slope hitting my exposed leg joints on the way. There were many tears. Needless to say I didn't finish but resolved at once to try again this year. Now, once again, I am only weeks away and I haven't done anything to try and resolve these issues. Even worse, last year at least I had innocence and naivety to start me off happy and full of joy (that lasted about thirty seconds). This year I intend to spend the weeks leading up to it assuming a foetal position and rocking in a corner. As I sat there, dedicating myself to breathing in and out of a paper bag, I received a call from my friend who told me they had heard about an endurance training camp that was starting on the Monday with a company called Trail Ferret. After making a few enquiries and establishing that this was just what I needed, I packed my bags and nervously drove up to North Devon to see what I could learn. After a few near misses on the road (I'm a terrible driver) I pulled into St George's House in Georgeham and met Ben, aka Papa Ferret, who explained to me what the week would entail. He was open and friendly from the start, which was at odds with my traditional stance of social awkwardness however he didn't seem to notice this and made me feel very welcome. Shortly afterwards four other people turned up and were introduced as Ellie, Harry, Ali and Paul. As someone who normally runs alone I felt nervous about being with people who run with clubs and was worried I would feel left out, but actually it was great talking with people who have the same insane urge to pull on a pair of trainers and go running for hours on end. 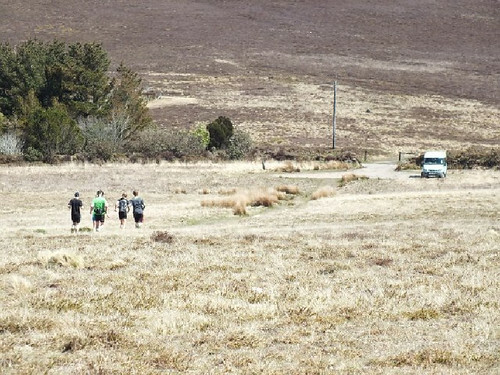 he next morning we were joined by others, Annie, Rich, Wanda, Dave and Adam, and were bundled into a minibus to start our week with a few hill reps. On sand dunes!! Coming from Cornwall I have ran on sand dunes before and it's not easy. Also, I have never done hill reps before so I prepared myself for public humiliation. I was correct in that I wasn't great at them (why are my legs so weak? Why?) 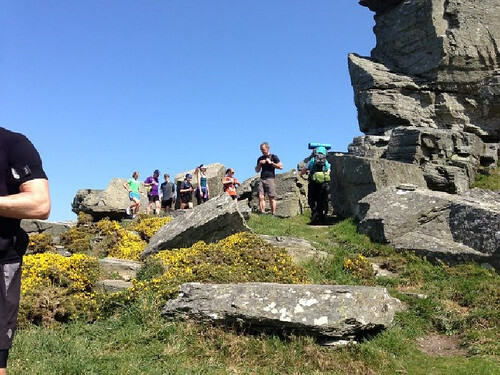 but I was saved embarrassment by the fact that Ben had allowed for the fact that some of us might not be as strong: I could turn around and come back down with the others if I hadn't reached the top and I didn't have to do the same number of reps as some of the stronger runners. Phew! It actually worked really well because it meant that each of us had the same amount of challenge relative to our own abilities and therefore were equally tired for our run home. 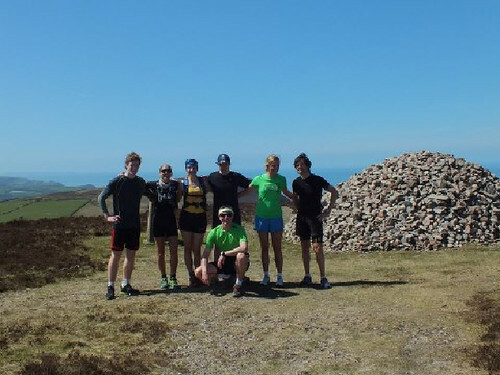 The hill reps were a great time for us all to get to know each other as well. I've found that nothing bonds people together faster than pain. I quickly became attached to Annie when I found she shared the same sniggering sense of humour as me, as demonstrated when Ben started talking about a place he had stayed in in Australia. I can't remember the full place name but it definitely had the word 'knob' in it which sent us girls chuckling away at the back of the group every time he said it. Now I know a little more of Ben's sense of humour I realise that this was probably done on purpose. We finished our hill reps and asked Ben how far the run home was going to be - "8 miles". I would learn that throughout the week the answer would always be "8 miles" regardless of the actual distance. Ben had accounted for the fact that some people may not be able to run the whole way every day and so introduced us to the idea of 'get out' stops: places along the run where the support vehicle would meet us and would pick up any straggling members of the group who were just too knackered to go on. This put my mind at ease a little. Knowing that the van was always just a couple of miles on again helps to push that bit more out of you and reassure you, to the point that the 'get out' was only used once. 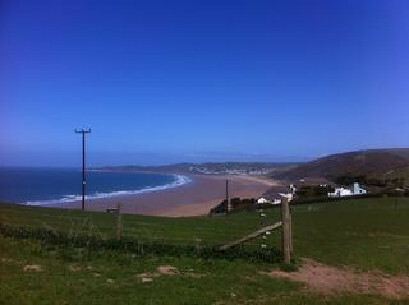 We set off across the Saunton Sands toward the coast path heading back to Georgeham. The weather was amazing, the first real heat of the year and all along the coast path the smell of coconut from the flowering gorse followed us. All in all the run, including the hill reps, actually totalled about 13 miles and I was pleased that I had felt OK and had kept pace with the group. The only thing to be concerned about was if I would be able to do the same each day for the remaining three days. In the afternoon we sat in the sun chatting about training and generally just laughing about our experiences. Considering Wanda's background of running ultras across deserts we were keen to pick her brains. Ideally, I wanted her to present me with some sort of magic word I could say before running that would allow me to fly effortless over the miles but apparently this isn't something that exists in real life. I told her about my problem with running up hills and how it was an obvious weakness. And by weakness I mean, I don't run up them, ever - I walk. Wanda told me to relax when I approach a hill and that a lot of the struggle occurs in the mind. When you see a hill approaching the natural tendency is to start thinking about it in advance, adjust your breathing and generally think an array of negative thoughts. Just relax, she said, take it slow and don't stop running when you get to the top. Keep going. Wanda and Rich laughing in the sun. I know what you're thinking and yes, that is Rich's actual hair. 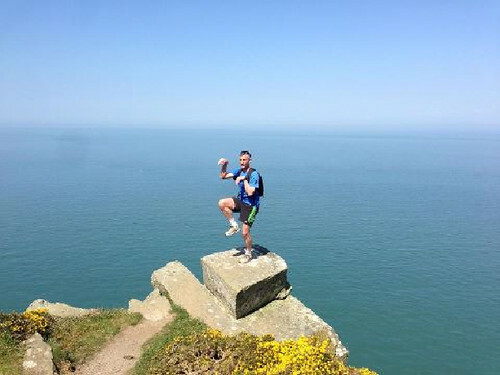 I would have ample opportunity to try this technique the next day as we were running from Lee Bay to Morte Point, and then onto Woolacombe and up over Woolacombe Down. We were joined by Sophina, who lives in Georgeham and is absolutely lovely It was another fine day for the weather and the scenery was amazing. Ben had introduced get out points again but much to our delight when we reached the first at Bull Point Lighthouse we found we had beaten the bus! There was much bragging all around. We continued on and I tried to keep up with the front of the pack as much as possible. Actually it was OK, and some great hill training. There were lots of places where steps climbed up and down the cliffs and it is true that just taking it easy, relaxing and keeping your breathing steady really does help. I was so chuffed that I ran (alright then, jogged) up all the hills. It'll be an interesting test to see if I can do this on the Classic Quarter. Not the 10 Peaks though. I'll be too busy crying. At Woolacombe we turned off and started heading up Woolacombe Down. I could see the hill looming above us and was slightly disconcerted by the fact that I couldn't actually see the top. I know these types of hills. Just when you think you've reached the top you realise you have only hit the first brow, and in fact these repeat endlessly over and over until it feels you have done nothing else in life but run up this bloody hill. I mentally slapped myself around the face and concentrated on relaxing. 'I'm so relaxed' I thought to myself. I then thought about my feet and ankles and marvelled at how floppy and relaxed they felt. We trudged on. I focussed my gaze on the patch of ground a few feet ahead of me. I had never looked at stones and grass so closely before. I fought the urge to look up and see how far we had come. Bizarrely, despite convincing myself I was the most relaxed I have ever been in my entire life, my legs started to feel heavy and painful. My breathing was becoming laboured. I found that I was following behind Wanda, Harry and Rich and decided to just stare at their feet until the pain ended. I told myself that what I was feeling was not pain, but in fact a new level of relaxation that had not been encountered before and actually I was entering a deep meditative state. I don't know who was behind me at this stage. I couldn't even think about what was ahead. It was just me, the feet of the three people with me and the grassy patch of ground a few feet ahead. That was my universe. I thought about all the people striving to find a way of separating themselves from a manic and stressful world, always seeking and chasing spiritual enlightenment. It occurred to me that all they need to do was run up Woolacombe Down to see how quickly the worries of life fade into the background. I wondered if Ben should advertise his camp as a spiritual retreat. 'We're not at the top yet' Wanda gestured to another brow off to the left and veered off to greet it. Ah. I hunched over and followed her, welcoming the final stages of deep relaxation. Of course we did reach the top and I'm pleased to say that we ran - not walked. And I continued running once I got there and started the descent back down the other side. My first victory of the week. Thanks Wanda! We met up with the support vehicle at the end of the beach and Annie proved what a great character she is by producing a bag of jelly babies for everyone. I must have clearly looked tired after all that relaxing because she gave me two. Ha! (NB on a side note I feel I should confess that there was another hill later on that I didn't run up. I did try but it was insanely steep and the relaxation got to the point where there were red and orange lights flaring in my vision and I was starting to lose my sense of sound. There were others in the group that made it though, and my admiration is very real). That afternoon Ben had arranged for Andrew Blake ("Blakey") from Bay Fitness to come over and teach us some yoga. I have never been to a yoga class but I do know it is the preferred 'exercise' for many women. I know I have put quotation marks around the word exercise. That's how I think of yoga when I say it. It's not real exercise. To be honest I felt that I had done enough hard work running up hills earlier in the day and I was looking forward to a gentle stretch and meditation of the more typical kind. Well. I don't know what happened in that yoga class. My only memories are of thrashing limbs and pain. I was severely betrayed by yoga. A couple of members of the group looked like elegant and graceful swans assuming one impossible position after another, but, judging by the strangled sounds of pain being produced by those around me, I wasn't the only one struggling. However, and this is the important thing, at the end of the session I had no stiffness anywhere which I was astounded by. I wish I could replicate some of the positions now I'm at home because it clearly is great for recovery. Unfortunately my mind has blanked it all out and I suspect it will only be years of intensive psychoanalysis that will unlock the memories. What? How? WT actual F is happening in this picture? Tuesday afternoon was a bit sad because I was losing my partner in crime, Annie, and also the fountain of knowledge that was Wanda. Who was I going to try and keep up with now? Then I remembered that we still had Paul and, of course, Papa Ferret. Both of whom had the annoying tendency to break way into a sprint as we struggled up a hill because it was the perfect photo opportunity. Why do people always want to take your photo as you're struggling up a hill? Why not wait until you're coasting down the other side looking fabulous? 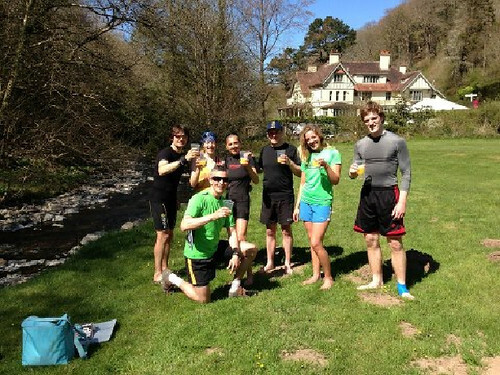 I was very excited about the next day because Ben told us we were going to Watersmeet to start the run. He showed us on the map and it looked right up my street, a long winding river valley in the woods. Ali told me I would love it there. I had an affinity with Ali due to our both being able to repeatedly state that the view was amazing countless times on the same day and often about the same scene. 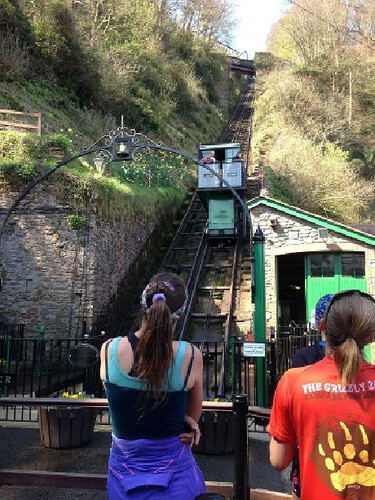 But the thing I was most excited about was that we were going to go up the funicular railway in Lynmouth! Hooray! The exclamation points are very necessary here. I couldn't wait. The night before Ellie, Paul and Harry had started up a cereal club (where basically you scoff cereal late at night) and Ellie and Harry had quizzed Paul about his running prowess. Harry was clearly inspired and stated in the morning "What Paul does, I do. If Paul rests, I rest. If Paul runs, I run." I decided to watch how this would turn out during the day since Paul can easily run a sub 3 marathon and had easily outstripped us all in the previous two days. We ran through sun dappled trees and passed a gurgling river (creative, I know) down to Lynmouth and ...(drum roll) the funicular railway. One of the reasons why Wanda wasn't here was that it was her birthday today and somehow the group had turned this into a reason as to why Paul should race the funicular up the hill. As you do. Paul accepted the challenge. I glanced over to Harry to see if he also would be running up the hill. Harry was looking with extreme and dedicated interest at the water driven carriages and didn't appear to have noticed Paul sprinting off. 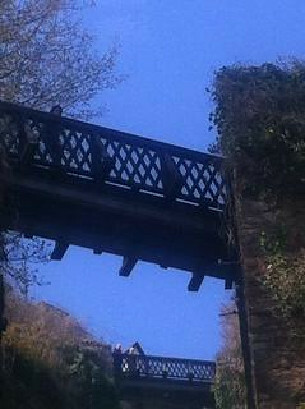 We saw him running over the first bridge, again I tried to take a photo but it was rubbish. Finally, we got to the top and I was pleased to see a little cafe there. I always like little cafes in unexpected places. Paul wasn't at the top. His feat of heroism was undone by his managing to get lost whilst remaining in sight and calling distance of his intended destination at all times. We all attempted to help by calling out directions to him, each one conflicting with the other, while he held up his hands in astonished bewilderment as to how this had happened. Go that way, Paul! No, not that way! The other way! It was an expression I know I often have. I had thought I was the only one who had the ability to get lost where families, old folk and blind people had found their way quite easily. Now I'm starting to wonder if this is the mark of a true trail runner. I made a mental note to be dismissive of any runner who claims to be faultless at navigation. What Paul does, we do. 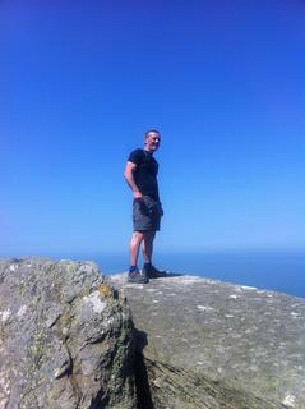 Anyway, we finally rescued Paul from wandering around Lynton for the rest of eternity and ran along the coast path to the Valley of the Rocks. This was turning out to be a cracking day. I mean the last two days were great as well but this was the sort of place where dinosaurs hang out. Really. Ben was excelling himself on the routes he was choosing. There were rocks jutting out over worrying drops towards the sea. Apparently. I didn't go near them myself but this is what I was told. Ben scared some passers-by by pretending to (almost) step backwards over a cliff when taking a photo. Oh, the hilarity. He then posed in ferret stance on an overhanging rock. Everyone laughed. I didn't because I was too busy throwing up with fear behind a boulder. A bit further on Dave and Sophina, who so far had seemed relatively normal, demonstrated their insanity by standing on a rock perched precariously on top of a precipice. They actually stood on it, and looked over the edge. As though that was a perfectly reasonable thing to do. Look at the photos. LOOK AT THEM. Bleeeuuuuurgh. However I was pleased that I retained enough of my wits to take photos. Maybe I am getting better. 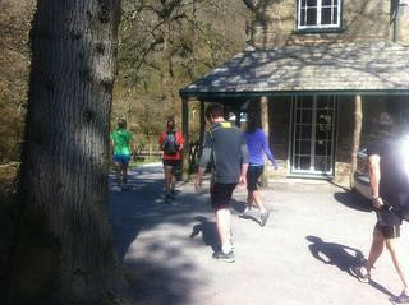 We ran on past Woody Bay and toward Highveer Point. The scenery was just amazing. If you're getting bored of me saying this imagine how it was for the poor people that had to run with me for four days. It was a pretty epic climb up toward Highveer Point and I looked to slot in behind Ellie as I had noticed she was pretty strong on the hills. Rich clearly had the same idea and squeezed in between us. Not in a weird way. Just to run up the hill, I mean. Rich is one of those people who would get sunburnt standing too long in front of an open fridge so he was slathered in factor 50 sun cream. He smelled fantastic. The heat of the sun beat down on us trudging away up that hill and all I was getting was coconutty loveliness wafting back to me, distracting me from my woes. This was a new way for me to keep pace with someone on an ascent. Simply find someone who smells so great that you would rather run your feet into bloody stumps than let them get away from you. We decided that Rich was going to try out the sun lotion approach when he next went out to impress the Laydeez. I can't see how it could possibly fail. And with that Ellie, Rich and I reached the top in a cloud of sweet smelling fragrance and congratulated each other on doing so well. We were now at Heddon's Mouth and we knew it was downhill all the way from here to Hunter's Inn in the valley where the van was. We regrouped and sprinted off down the hill, passing day trippers who could only stare at us in awe whilst we zoomed by. I like to think I can remember them clapping and cheering but this might just be my mind playing tricks. We ended at Hunter's Inn and Ben encouraged (forced) us to sit in the river because the Arctic temperature of the water would help our muscles recover. 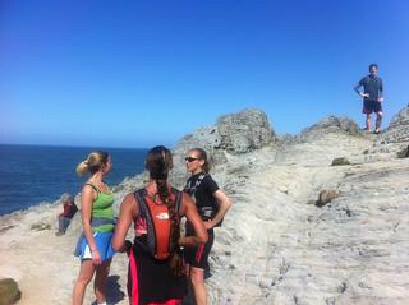 Considering I had now done a third day of hard trail running I was feeling great. I was convinced the hill reps on Monday and the hill running was making me stronger and I was determined to include them in my training when I got home. Ben told me that a lot of the running I was doing up until now was 'junk miles' i.e. I was just plodding along without actually building on my strength, speed or stamina. Well, this week was changing that and I was starting to feel a lot more positive and confident about what I was capable of. Ben explained that Blakey was going to take us through some strength and conditioning exercises. Oh joy. There's nothing I like more than being given the opportunity to display my physical weakness in front of a group of near strangers. In my defence, it was a challenging session for all of us. Although, I may have been slightly more challenged compared with the others. That Blakey certainly knows his stuff. Ben had explained during the week that it is important for runners to build their overall strength as well (he had looked pointedly at me when he said this) as it will help with speed and endurance. All I knew was that I was going to hurt the next day. That night we went off to the pub and Ben talked to us about any questions we had about our individual training. We all had different queries but we were all interested in training plans, building strength, recovery, which events to enter and nutrition. Ben was able to give detailed and individual advice about each topic but most notably he asked each of us why we were running. Strangely, I've never thought about this before. I had always entered races blindly, whether it was an ultra, a 10K, a road or a trail race, and normally the main reason would be proximity to where I live. I hadn't thought before that these are all different races and it's difficult to train for every type of race at the same time. Why was I racing? Why do I run? I thought back over who I had met over the last few days and who I wanted to emulate: there was Paul who was a committed racer bringing in times that I could only dream of, Wanda who was possibly the most adventurous person I had met in real life, running the Gobi desert, the Marathon des Sable and the Atacama, and Ali, who after not managing to get a place in the London marathon one year decided on a whim to enter a multi-day ultra-event instead. Ellie and Harry had both recently completed the Paris Marathon which sounded fantastic. I realised I didn't care about getting a great time in a local 10K or half marathon. I want adventure and to use running as a means of exploring the world. I want to see new places and meet new people, to always be moving. I accept that in any event I'll have my ups and downs (literally) but what's important is that I cross that line running. Oh and that when I get up the next day I am able to run again. Wow, that was a bit deep. We'll step back from that thread of narrative onto a more light-hearted note. Thursday was our last day. 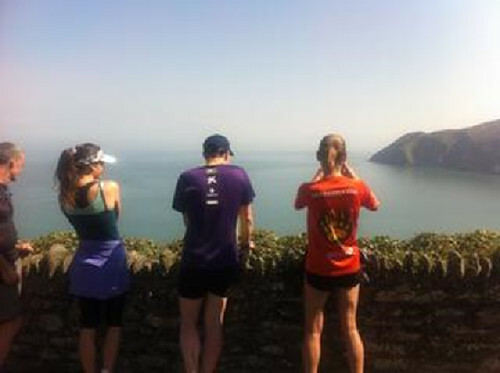 We knew this was going to be the long run - roughly 17 miles of coast and trail running (8 miles according to Papa Ferret) which included some of the higher peaks on the edge of Exmoor. 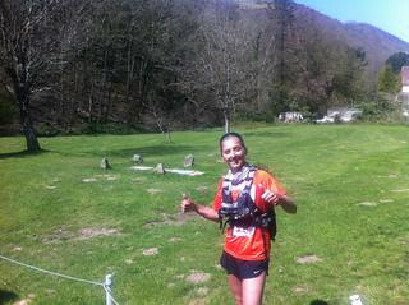 I still felt OK, no stiffness which was a miracle but I felt pretty tired. I think we all felt like that. Paul had pulled something in his bum cheek, sorry, I mean gluteus maximus, which was giving him some difficulty. We started at Lee Bay with what seemed like a 100 mile uphill road to climb before we joined the coast path. Since we had three days running behind us, Ben conceded that we could stride up it with purpose rather than run until we were good and warmed up. It seemed to take forever for my legs to start responding to basic commands but by the time we reached the path I was able to manage a slow trot. 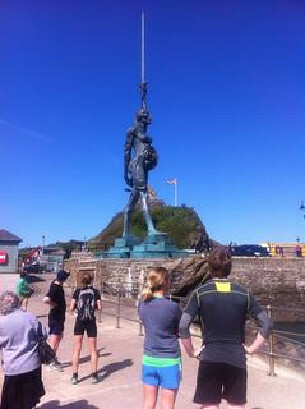 Ben and Rich kept on telling us that they were going to introduce us to Verity at Ilfracombe. Ben didn't seem particularly taken with this woman, whoever she was, but he refused to elaborate further at that point. 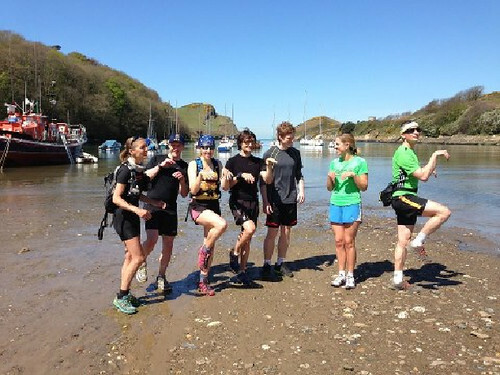 We ran on to Ilfracombe which looked like a great little town. I was surprised that no one had ever recommended it as a place to visit before. Maybe it was the sunshine but in my mind it had a distinctly Mediterranean feel. It was probably the sunshine. The harbour was dominated by a huge statue of a pregnant woman. Verity. I remember now seeing it on the news when it was erected and all the locals were up in arms about it. I quite liked her. It's a Damien Hirst piece that represents the high number of teenage pregnancies in the town. I also didn't realise that Hirst actually lives in Ilfracombe. Ben was imparting lots of cultural facts to us today. The support van had met us in the car park where Verity was and Tom, the driver for the day, was dishing out drinks and establishing if any of us were having a physical breakdown and needed rescuing. This is a great time to say a huge thanks to the staff at St George's House who kept us fed and watered for those four days. All the food was home cooked and tasted great, chicken pie, sausage casserole, chicken curry and puddings for dinner as well as breakfasts and lunches. I could write an entire review about Tom's home-made banoffee pie. I was introduced to it on Tuesday evening after dinner and had two helpings. I had to go back and raid the fridge on the Wednesday and have another two helpings and by the end of the stay I finished off the lot. It still calls to me now. I ate it all. I ate it all and now it's dead. Its ghost still haunts me. Thankfully Tom told me how to make it and Ali sent me a recipe as well so fortunately it will always be there. On dark days when I need it most. Sorry, I went off on a tangent there. Special thanks to our support crew, Tom and Matt, who took it in turns to be our safety blanket throughout the week and provide us with custard creams. I would always feel a warm glow at the sight of our little minibus in the distance waiting patiently for us. I never actually needed it but it was nice to know it was there. 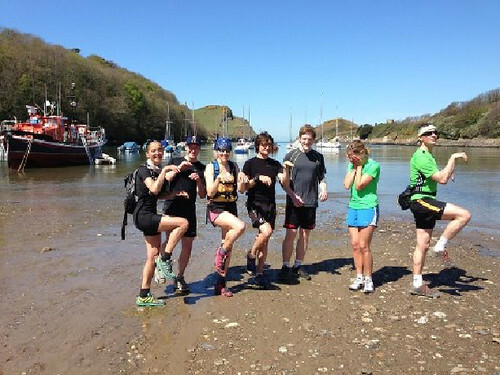 It was at Ilfracombe that Ben and Paul decided to try and do something about Paul's hurting bum cheek. Harry's ankle had swollen alarmingly on the first day and Ben had already proved his medical worth (Witchcraft) by massaging strange potions and strapping up the ankle so that Harry was able to run on it without pain. Now Ben was to be tested again. We were chatting outside the van and barely noticed Ben's instruction for us not to look inside the van while he attended to Paul's problem. After a while it occurred to us we hadn't seen them for a while and we looked around in puzzlement. The sun was shining directly behind the van and all we could see was the silhouette of Paul bent over at the waist and Ben fiddling around his rear end. 'What are they doing in there?' asked Ali in a small, confused voice filled with childlike innocence. I declined to answer and instead, as a group, we watched silently until after a couple of minutes Paul emerged looking much happier and adjusting his shorts. Ben followed him but with an entirely different demeanour. He looked a broken man, hunched over and carrying the shamed expression of a person who will never be entirely clean again. He remembered his flock and gazed blindly toward us. 'Just keep running' he rasped, before breaking into a shambling run after Paul, who naturally had sprinted off into the distance. We stood in silence for a few moments, wondering what to make of what we had just seen, before shrugging the incident off and loyally following after our leader. Ben was fine really, of course. I wanted to demonstrate his sense of humour and this seemed like one of the easiest incidents to describe on paper. There were many other examples but unfortunately they cannot be put in print. Assuming the ferret pose at Watermouth. Except for Harry. Look at the hatred in his eyes as he looks at Ellie. He punched her in the face just after this photo was taken. 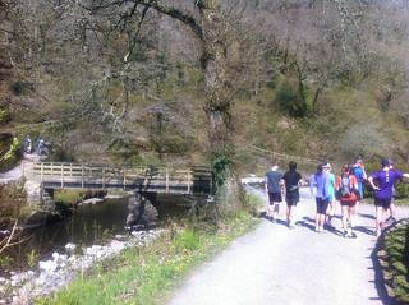 We kept on going past Watermouth and Combe Martin. The van met us again for the last time between here and Holdstone Down. I knew the next section was going to be a real test of our hill training, climbing Little Hangman at 218m, Great Hangman at 318m and finally Holdstone Down at 349m. Going up Little Hangman I decided to follow behind Ellie again who was being very patient with me. It can't be pleasant having a person breathing down your neck on every single hill you climb. I felt guilty but not enough to actually leave her alone and climb up from a respectable distance. I needed to focus on her feet in order to get up those hills. That might sound weird and creepy. I don't care. I don't care how many enemies I make with this approach. Deal with it. It was hard going up Little Hangman but you'll be relieved to hear that we did manage to run to the top and Ellie kindly decided against taking out a restraining order. I decided to slow down a bit going up Great Hangman and Ali was good enough to keep pace with me so I wouldn't be lonely. We reached the top of Great Hangman and I had just allowed myself to start feeling smug when I looked across to see the next peak, Holdstone Down. Well, that put a check on any feelings of pride. At least when we climbed Great Hangman we had the advantage of starting at 218 metres. The path now descended steeply to almost sea level before rising up, and I mean straight up, Holdstone Down. Ben asked us how we felt about going straight over the top of Holdstone Down instead of around the side. There was a few moments silence before we answered, but we all knew which way we were going to go. We had all come too far to take the cowardly way out. I thought that the climb up was going to be my main challenge, but no. On the way down my nemesis appeared unexpectedly from nowhere. Not the boulder and loose stone scree that you get in the lake district but the type where a path reaches a certain angle of inclination where even just normal terrain wants to slide out from under your feet and send you hurtling to your doom. Of course the others skipped down without a care in the world but I instantly froze and assumed a crablike position, clinging to blades of grass, dandelions and any other ridiculous object that I was convinced would save me should I fall. See? Which is better? Unfortunately I couldn't make it to the bottom and Tom had to run along from the support van with my lap top and some banoffee pie, where I remain to this day writing this review. Hahahaha. Well I did make it to the bottom really and we started the trek up to the top. This was our Everest. We were on our fourth day of running, all of us were tired. The slope rose up ahead of us to an impossibly small point in the distance and the heat of day shimmered in a haze a few feet above the ground all around us. We lost the path - of course - and silently picked our way through burnt out gorse and calf spiking twigs in an attempt to find it again. Every piece of foliage seemed determined to work its way into our shoes and socks. There was a heart-warming moment when we found that we had been running only a few feet away from the correct path, and parallel to it for an amusingly considerable amount of time. We then lowered our heads and continued running up the hill. Paul broke away from the group and I saw Harry speed up to keep pace with him. "Do as Paul does". 'Go on, Harry!' I willed silently. If you're going to do as Paul does then running up the highest peak of the week with him is the way to do it. I kept running. I didn't know where Ellie was, my hill climbing buddy, and I didn't dare look around for her in case it put me off my stride. I didn't know where anyone was in relation to me. The path was rubbly and my feet seemed intent on kicking loose stones on to the other poor foot, which would instantly retaliate on the next step. And still we kept climbing. We kept running. Don't look up, I thought. Just keep going. I could hear the others breathing hard around me and suddenly I knew that we would make it to the top. Nearly all of us had confessed that we felt nervous at the beginning of the week, would we be able to run each day? would we be fast enough? would we have the stamina? but each of us had made it this far. As we kept moving upward I heard the sound of angels singing as we crested the top of the hill, trumpets were playing and the sunlight couldn't compete with the shining glory we were emitting. I am prepared to accept that I may have been hallucinating at this point. OMG you guys! We are so awesome! Look at how awesome we are! This was the final van stop before the end and Ben, out of habit, asked if anyone wanted to get in the van and meet us at the finish. I think you know the answer. We were all far to buoyed up to get in a van, and of course what helped was the fact that it was all downhill from here. Running felt easy now, there was no thinking about where to step next, no crashing into each other or getting in the way of someone else. It felt like we had been running together for weeks. Down in the valley we could sense we were near the finish and picked up our pace, jumping over stones and dips in the path like they weren't there. With half a mile to go we were practically sprinting. 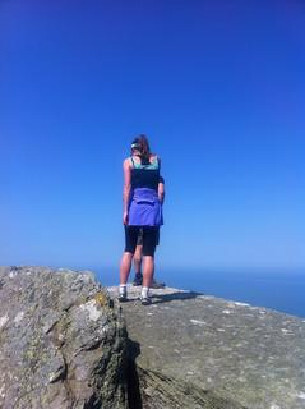 Paul expressed disbelief at the pace we were doing considering we had just run miles and miles of coast path. The Magnificent Seven finished strong, running fast toward the support vehicle for the last time. I like to think there was a little tear of pride in Papa Ferret's eye as we finished. So, how to conclude? I had a fantastic week and met some great people who I will try hard to stay in contact with. I've not been able to do justice to all their characters and quirks in these pages but I learnt something from every one of them. I've made some great friends. Thanks for everything, fellow Ferrets! Ben (Papa Ferret) had planned the week well, on each day the route was fantastic and what was sold as an endurance camp was actually also a sight-seeing holiday of North Devon. It's a lovely place and I'll definitely be going back. Ben has a great enthusiasm for trail running and that, combined with a mischievous sense of humour, really helped the group bond and made the week fly by. His knowledge about training has meant that I have come home with more direction and a better idea of where I want to go with my running. And finally the people at St George's House were just brilliant and so welcoming. I've never been anywhere before where everyone looks like they're having such a great time simply by being at work. It was a novel idea. Thanks to all. And with that I'm off to do some hill reps. Hopefully you'll see me doing a sprint finish at the Classic Quarter (please don't hold me to that).